How often have you felt wonderful at the end of your holiday - refreshed, relaxed and full of the joys of life - only to lose that great feeling a few days after returning to work? Here’s a spell that could help you keep the holiday spirit a little longer. It is mainly intended for those on holiday at the seaside, but could be adapted. 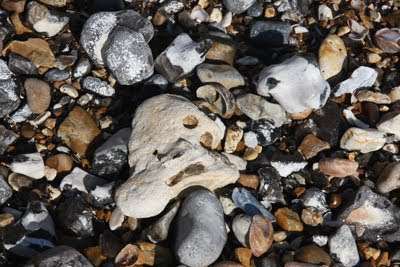 On the last day of your holiday, ideally in the early morning or around dusk, go for a walk on the beach to find a small pebble to serve as a memento. You should take your time searching for the pebble that feels just right – you could select it because of its colour or shape, or you might be lucky enough to find a piece of crystal or a gem. If you find a stone with a hole right through it – often called a hagstone – that is particularly magical. Then spend some time holding the stone and thinking about all the happy memories you will be taking with you from the holiday. Try to focus your thoughts and feelings into the pebble. When you have finished doing this, thank the spirits of the land, sea, sky and place once more, put the pebble somewhere safe and say farewell. As an extra thank-you, either before or after doing this spell, you could also do a some litter clearing from the beach and put any bottles, cans or whatever into the appropriate recycling bins. The second part of this spell is more practical than magical. You need to keep the pebble with you as much as possible after you return from holiday. You could just keep it in your pocket, purse or handbag, but you are likely to forget about it or end up regarding it as a bit of clutter – which means the spell won’t work so well. I think the ideal way to store your magical holiday memory pebble is on your keyring. Our keys are usually something we carry around with us, and very much tie us to our everyday lives as they open the doors to our homes. If you found a stone with a hole in it then it is really easy to attach it to a keyring. If not, I recommend buying a keyring with a crystal cage and pop your pebble inside it. These spiral cages can be bought at many shops that sell crystals and at New Age or pagan retailers. You can also order them from Amazon. Now, how to use your magical stone once your holiday is over. Your pebble will work as a memento and a talisman just by you carrying it around. However, if you need a bit of extra help – when you feel that the stresses of everyday life are getting you down and sapping that holiday feeling – hold your pebble in your hand and let those thoughts and feelings that you stored there flow back into you. Know that the spirits of the sun, sea, sky and place have blessed you. Breathe deeply, and allow yourself a moment of peace and joy. Note: Before taking any pebbles do make sure that you are not breaking any local laws by doing so. Never remove any stones, even tiny pieces, from sacred sites such as stone circles. We're going on holiday to the seaside next week. I have a small collection of pebbles and shells on display in my bathroom from previous holidays. I bring back one every time we go to the seaside. And I have pictures of the sea on the walls as well. It works for me!